You are here: Home / Ent. / Dr. Boyce Watkins; South Park Goes After Tyler Perry…. Dr. Boyce Watkins; South Park Goes After Tyler Perry…. (ThyBlackMan.com) South Park is a show that takes no prisoners. Sometimes they can be brutal, and when your name is mentioned on the show, you might as well prepare to be embarrassed. The latest victim of the show is Tyler Perry, who is presented as “Funny Bot,” a woman in a dress who tells silly stereotypical jokes that make you laugh over and over again. Every time Funny Bot throws out a catch phrase (“Oh lawud, this chicken sho is hot!”), someone hands him a dollar. He is also, by the way, presented as the greatest threat to all of man-kind by President Barack Obama (you can see a clip by clicking here). Personally, as a person who has been a fan of South Park since the show was started 15 years ago, I felt that they went light on Tyler Perry. Aaron McGruder, creator of “The Booondocks,” went all-in on Tyler, insinuating that Perry is gay and engages in sexual harassment on the set. 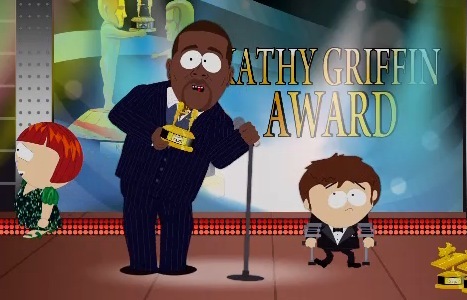 The South Park folks don’t seem to go there, which surprises me, because they’ve put the hammer down on Michael Jackson and Tom Cruise in the past. This is, of course, not the first time someone criticized or poked fun at Tyler Perry. Spike Lee has gone hard against Perry for years, with Perry responding in a way that shows that the criticism has really gotten to him. The best thing for Perry to remember is that the bigger you are, the more haters you have; so the brother should just keep it moving. At the same time, Perry is well-aware that the bulk of his success on-stage and on-screen occurred because he got up one day and wondered what would happen if he were to put on a dress. A large chunk of Madea’s success (as well as Big Momma, which really makes me roll my eyes) is a reflection of the fact that the black audience hasn’t matured and evolved as much as we would like to think. One can’t imagine a white man making a movie in a dress and expecting the film to be #1 at the box office. But that did happen 25 years ago when Robin Williams (Mrs. Doubtfire) and Dustin Hoffman (Tootsie) did the exact same thing. But the fact remains that Williams and Hoffman only put on dresses once or twice; they didn’t try to make an entire franchise out of it. Perhaps one day black people will get some power in cinema without having to do things that are a bit primitive and immature. As the critically-acclaimed actor Jeffrey Wright said the other day, “There is no Black Cinema.” Black people must obtain the capital to begin telling a multitude of stories, not just the ones that remind white people that we are fun to laugh at. So, perhaps by putting on a dress for a few years, Tyler Perry can open up black cinema for something a bit deeper and significant. Watch the damn episode for gods sake. Really you should have watched the episode. It really was not that good, compared to past episodes. That being said, Trey and Matt made the same point as you in the episode. Only the black kid named “Token” laughed at Tyler Perry’s jokes, even though he did not really want too. Token could not help himself. South Park has a tendency to be multi-layered in its political statements. It is hard to pick up on some of the nuances in a summary. Personally, I don’t understand why Perry is to blame. I assure you that his audience is largely black and caters to this demographic. If black american deserves better, then maybe they should stop watching Tyler Perry movies. Tyler Perry is a person like anyone else, who needs to make a living. If his films are successful, then that is not his fault. He has also used the capital from his Madea films to produce films like Precious, which, might fall under that “better” category. I understand the criticism of the writer if indeed the episode wasn’t viewed. That doesn’t take away from the much larger point that Perry is in a tremendous position to make movies that are “deeper and significant” and chooses instead to repeatedly make low-brow entertainment. The black audience—and all of Perry’s audience—deserves better. Kurt Matheson is right. Why did you right this article? You didn’t watch that episode of South Park. ‘Funnybot’ was a robot, who was terrorizing the students, while ‘Tyler Perry’ was just hanging out with the students, and was in a dress most of the time. Two completley separate characters. It was only the ONE kid laughing and giving Tyler Perry money while everyone else just looked at him, not getting his humor. That was the joke. Why did you write about this episode if you didn’t see it? You got the whole premise painfuly wrong. You wrote this article witout seeing the episode. Terrible.